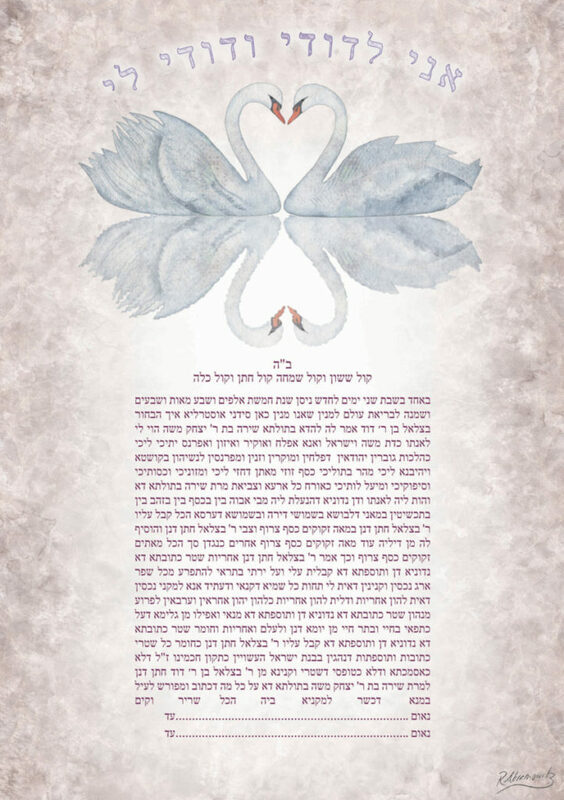 The ‘Swan Song’ Ketubah is a Sonnet to the Magic and Majesty of Swans. The embrace of their elegant and elongated necks coil in pensive union to form a heart. This in turn is reflected in the pond below, mirroring the transcendental nature of their love into other dimensions. 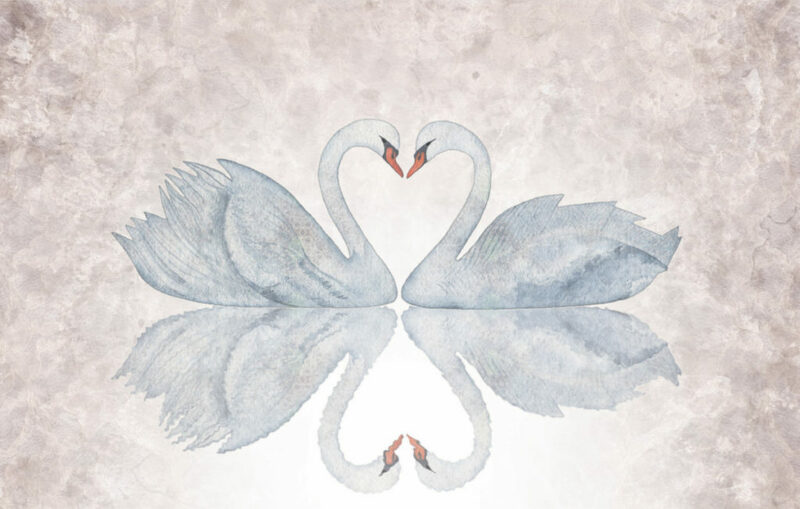 This symphony of these two swans, serenaded in each others love is a symbol of the married couples’ shared deep connection, chemistry and conflation into one union and into forever. 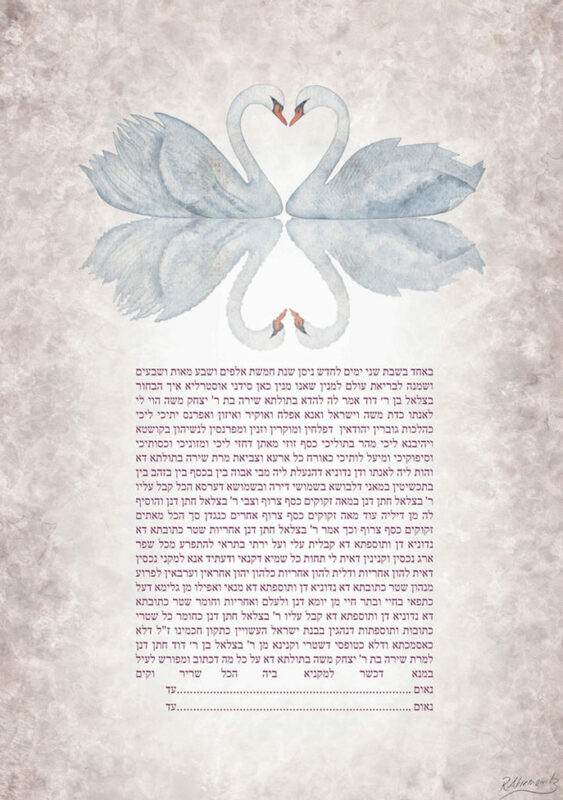 This Ketubah is a perfect compliment for couples to whom the quietness and stillness of a meditative Swan Lake resonates, and those who feel their love story itself is a meeting of the minds in the midst of a misty pond. Above, in lavender lace detailing, the hymn “אני לדודי ודודי לי – I am my Beloved’s and my Beloved is mine” (Song of Songs – Shir HaShirim 6:3), a romantic declaration written by King Solomon which expresses the affinity between husband and wife, curves around the Swans. In doing so, it gestures the shape of an enclosure which foreshadows the home that will be created and the union of the destined souls as one. If you have any elements you would like to personalise or variations to the background, please get in touch. I would love to make this Ketubah everything you want it to be. Creating Ketubot and artwork honouring weddings and other momentous life occasions. Cherished today, tomorrow and forever.